So, I've tried pho a few times when I was working in Markham. I wasn't a fan. I tried to like it. I WANTED TO LIKE IT. 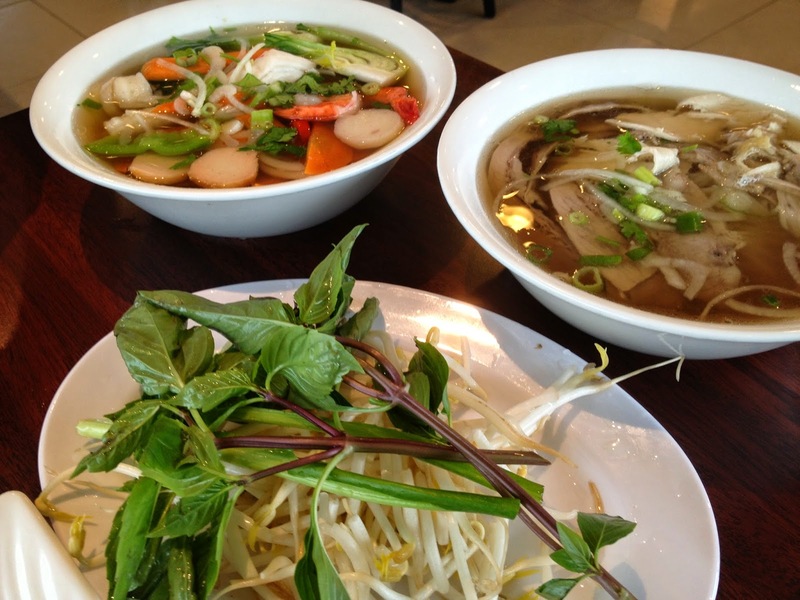 Everyone talks about pho like it's the best food on the planet, but I just can't love it. Since, I can't find a pho I like, I didn't think it would be fair to review a restaurant based on a food I haven't grown to love. This was on 2 separate visits. We started with Shrimp Rolls and Mango Salad. A great way to start. 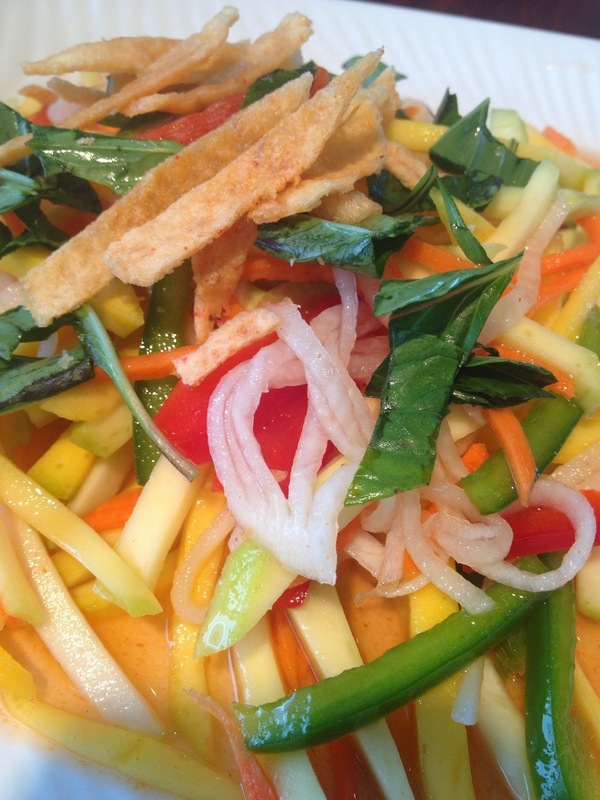 The mango salad was amazing. It was smothered in a sweet sauce with green peppers. Wow. The shrimp rolls in rice paper were good; very fresh. I don't remember what kind of pho we had on our first visit, but I can't give my opinion. So, here's a picture of it. Enter Vermicelli. Well, hello there. Come here often? 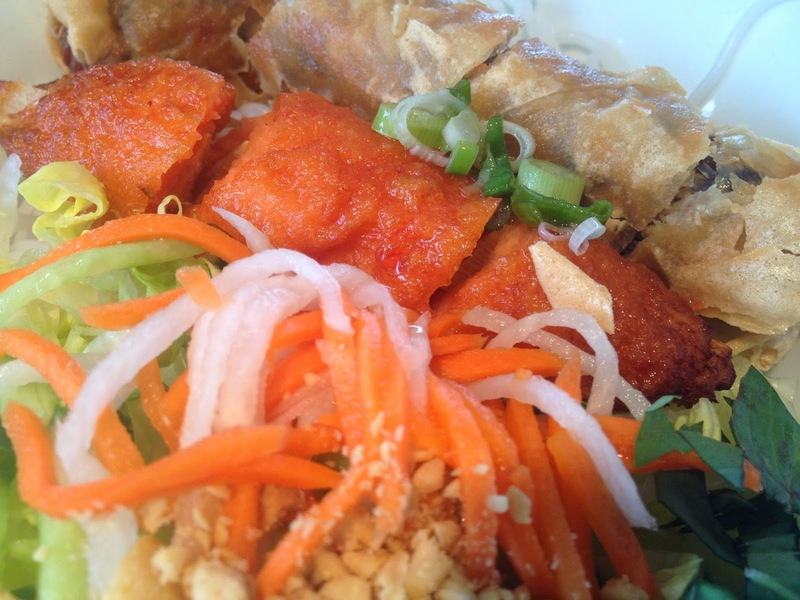 Oh vermicelli. How you've found your way into my heart and onto my thighs. I ordered the vermicelli with spring roll and grilled meat and my mom ordered the vermicelli with spring roll and shrimp on sugar cane. Their spring rolls are different. They're not like Chinese spring rolls; these are full of meat and only meat. The description says pork and shrimp, but it doesn't taste like either. It's hard to pick out the spices they used. The grilled meat was a sausage; I didn't expect a sausage, but it was good! My mom's dish was confusing at first. She didn't realize the shrimp would be skewered on the sugar cane and breaded. We didn't know what it was. She dug in and it was good. The salad was salad. The noodles are addicting. So light and tasty. If it was a bowl full of spaghetti noodles, we couldn't have finished. It's the giant meal that doesn't put you in a food coma after. Win-Win. Dessert. We had room, why not? They had various ice cream sundaes to choose from and many toppings as well. We were shocked. The ice cream was AMAZING. It was creamy and delicious, like the good stuff you get at the grocery store or Kawartha Dairy! The fruit was fresh and the toppings were plentiful. I know it's a simple dessert, but we were pleasantly surprised. The service was great on both visits. Our server was funny and good at explaining what the menu didn't. We had the same gentleman both times. He's fantastic and makes you feel comfortable. He must be used to customers venturing into unknown territory! The prices are also fantastic. You really can't go wrong. I'd absolutely go back, that's why I did. I knew there was something good in this place!